Thanks to Pudva for highlighting this particular game which we were surprised to see!…. Prophecy 1: Viking Child was a semi-popular game on the Amiga platform, and was a fairly neat scrolling platformer game. It was very much a Wonderboy in Monsterland clone which was designed by Imagitec. 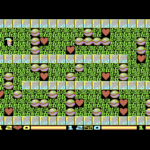 A preview has existed it seems for some time of a C64 conversion of the Amiga game, which is advanced to the point of having a controllable character on a single screen and some presentational graphics like in the Amiga version. There are also tunes by Guy Shavitt. Everything seems polished enough to suggest that this was an official conversion that was being done. Well, thanks to Compounded and his excellent detective work – we got in touch with Andras Baneth, who confirmed that he was working on the conversion back in 1992 at the age of 14. Sadly the game only got as far as what you can see here, before it was cancelled (the reason we should find out shortly). So there is nothing more to really search for. Also it is confirmed that the conversion was not official, and was being done after inspiration of seeing the Amiga version. A lack of commitment and other priorities for someone of Andras’ age took over, and they realised that there was probably no benefit to finishing the game – and so it was put to rest. You can read more about the development from Andras below in Creator Speaks. We hope to hear from Andras Toth about his work on the project at a later date. Interestingly though, contributor Ross Sillifant mentions that Raze magazine (when reviewing the ST and Amiga versions) had the game down for a C64GS release too. So was this ever actually started? “Unbelievable to see this childhood memory making its way online!!! I was 14 in 1992 so it was quite some time ago, and I was the ‘programmer’ and my friend Andras Toth designed the game. Unfortunately, and sorry to disappoint you, but we never finished the game and we only got as far as the intro you have seen. It was sent to some magazines back then as far as I remember and got positive reviews, but then we just didn’t complete the project. It was certainly written on C64 as I had never had an Amiga, though my friend Andras who did the graphics had owned one and I remember starting to program it at his place, so it could as well have been his Amiga with a C64 emulator or similar. On a roll today 🙂 Might want to put up C+VG scan, issue 104/Page 48, ST version reviewed, but in box out it mentions an 8 Bit version being a possibility, but only after the game was released on consoles in USA…..
Judging by saved image (on my PS3 of all things..) it was Raze Issue 02, Page 68. I can send image on if you like? Raze (when reviewing ST/Amiga versions of this game) had this down for a C64GS release to follow soon, alongside the Atari Lynx version. Thanks Ross, will add that into the review. Do you have reference to a scan that I can add? Many thanks! Hi Guys, it is indeed me !! I had a spare few minutes and googled the name of the programmers – there’s every chance that the coder Andras Baneth is the guy i’ve informed you about – who seems contactable. Thanks Gary – very much appreciated! Contacted him, and hopefully we’ll confirm if it is them or not. Fingers crossed!